Blogging is not a simple business. As any other activity, you need to put extra effort in its development. It requires diligence and full engagement. Blogging is one of the elements of marketing strategy. Creating a business blog may become a great communication tool with prospective clients. The blog works on the reputation of the brand, attracts new users to the site, increases loyalty to the product, and influences the level of sales. A business blog can give you a chance to demonstrate your experience and become an expert and leader in a certain field. 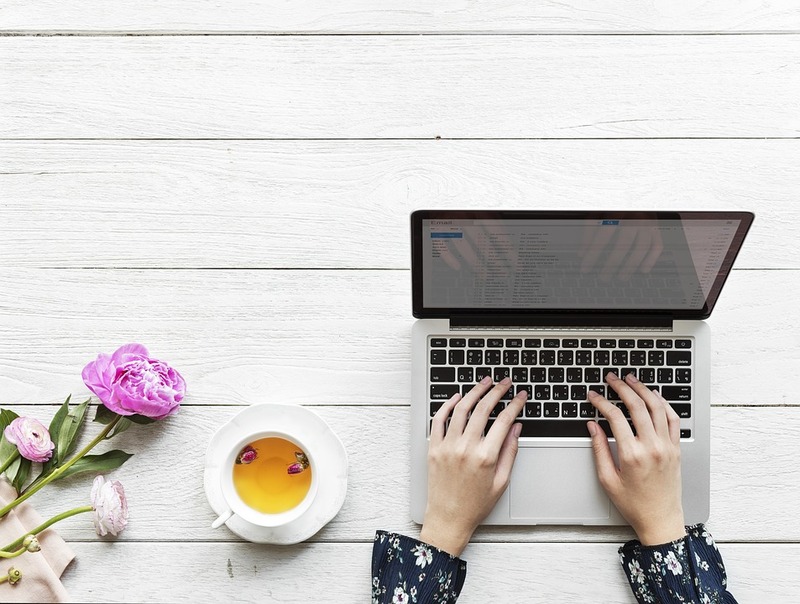 If you haven’t already used this invaluable tool in your business, we have created a guide that will help you create the blog and generate high-quality content to make it successful. So, how to write a business blog that will be both interesting for your readers and beneficial for your company? Increase the visibility of your company and appearance in search engines. Create your brand and promote your products and services. Improve channels of communication and networking with people who share your interests. To expand its capabilities, to go beyond the real sphere of influence. Build your credibility as an expert or leader in your field. Show that business is not impersonal. Create new contacts with clients and other interested parties. You need to know what goals you want to achieve and be sure that all your efforts will contribute to your business. In the following article we will tell you all the peculiarities on how to create a business blog and make great blog posts for your readers. Step 1. Think about your audience. What kind of clients do you have? What topics will be interesting for them? Even if you think that your prospective client has no time for reading blogs, you have a way out. Most people that have connection to the internet try to find answers to questions. Usually a decision about buying a certain product lies on managers, not on owners. But that doesn’t mean that you need to write about everything. You can write about topics related to your activity, about management tools, or successful decisions. The best decision will be creating a content plan. This means that you will list the topics of planned articles during a certain period of time. You will need a good plan before you start writing. Step 2. Analyze your competitors. No matter how long you are on the market, before starting a blog you need to look at what your competitors are doing. 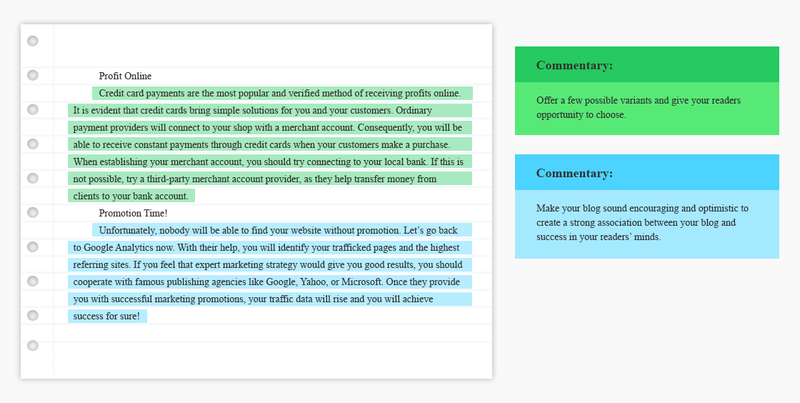 Analyze what topics for blogging business your competitors try to cover. What strategies do they use? How can you do it in another way? List the most popular topics and save them into your documents. Step 3. Create a content plan. What does it mean? A good blog combines good content, design, and frequency of publications. Also you will need to formulate the main goal of your blog. A business blog doesn’t mean directly selling your products or services. Try to alternate different types of content (overview guide, cases, text and infographics, expert opinions), and also try to observe approximately the same intervals between publications of posts. Step 4. Think how you will promote your blog. Do you need a person that will write the texts for you? Do you need a professional that will help your blog posts appear in the first rows of a google search? If your company can afford it, think about hiring a content writer and SEO specialist that will help you promote your company’s blog. If you have decided to write blog posts on your own, read the following advice on how to create interesting content for your blog. The main question for every blogger is what to write about. First, you need to understand who your audience is. 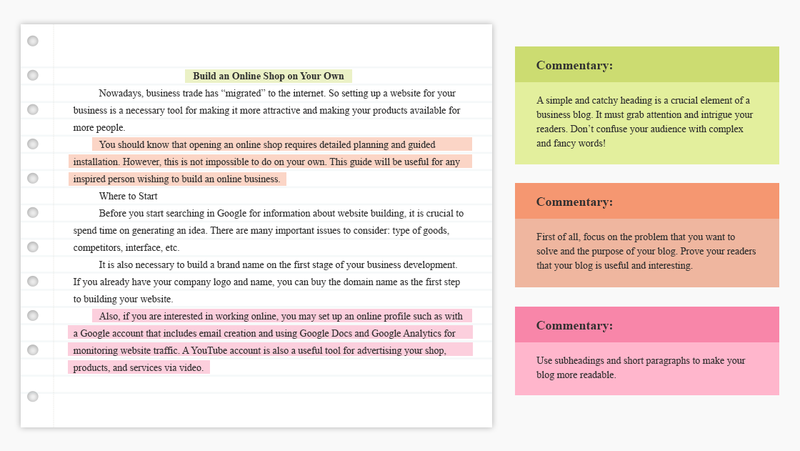 To cover more people’s interests you can divide your content in rubrics. For example, it may look like these: for novices, for owners, for marketers, and for professionals. Then pick a list of possible themes that may be interesting for your intended audience. When you will decide on topics, pick appropriate keywords in Google Analytics or other sources. These sources will help you find the words that are frequently searched by users. Try to find a keyword that has enough requests to increase the possibility that your post will be found by potential readers. Brainstorm about the topic. Conduct a little bit of research: read the available articles related to the chosen topic on the internet and other sources. You can also share your knowledge and experiences in your field, but you can quickly run out of such information. Create a catchy title for your post to attract the reader’s attention. Make a short plan about your future post. What points will be better to cover in the post? Divide your text with subheadings and write the text accordingly to these subheadings. You can choose another strategy of writing and use – for example, a freewriting technique. The better decision will be combining informational posts with your own comments and views about the issue. Accompany your text with a photo or picture related to the content. Visuals generate more engagement to your post, as our eyes tend to look more at images than at text. When you have found a relevant high-quality image, make sure that you have enough rights to use it (maybe you will need to buy it or list the author’s name). Make your text more interesting by adding case studies or stories. If you operate with numbers or statistics, you can create inforgraphics, charts, lists, and diagrams that will not only catch attention, but also look professional. Write a brief conclusion and a call to action if appropriate. When the text will be finished, check it for grammar, punctuation, and misprints. As this text is a kind of representation of your company, any mistake can be considered unprofessional. Check whether you have included all desired keywords into your text and if it looks natural. Make sure that keywords don’t look too obvious, like taken from a different context. Don’t use too many keywords as it may look weird. Post it. You can schedule the post for a month ahead on certain dates and on certain times. When you have regular readers they will be waiting for new posts. Share the post on social media. This will help you expand your audience and inform your followers about the new post. Interact with readers. This means that you need to reply to any comments under the post and in social media. Maybe someone will have questions or just wishes to share appreciation. By replying you show you care about the readers. To have a better understanding of how a business blog post should look, we recommend to take a look on our blog examples for business. With the help of the samples written by our experts, all questions that may arise while reading this guide will be clarified. Business blogger templates can give you some brilliant ideas and kick-start your writing if you are experiencing writer’s block. Take a pencil and note everything that you can apply in your writing. Try to make posts with certain regularity. The more high-quality posts you make, the more likely the reader will find your posts in a Google search. This is important because internet users are constantly looking for information about certain products or services, and it will be better if they will find needed information on your blog instead of on a competitor’s website. There are no rules about the length of your post. Just remember that it should be informative and interesting enough so the reader will easily read it. No matter whether it is a long post or a short one, the reader will find it useful if your article completely answers his of her question. One good option for your blog post is to include different points of view on the topic. Get inspired by what other people have already written and connect your own view point. Pay great attention to the title. A poor title won’t attract the reader’s attention in a long list of search results. See how other people create titles and get inspired. Don’t stop experimenting. You can apply various techniques and cover different topics in your blog. Only practice will show you what posts are more popular. Don’t forget about cross-links. That means that at the end of your article you can add links to other related posts on your site and invite the reader to stay on your blog a litter bit longer. Use data for your articles where suitable. Such evidence will make your post more convincing and more eye-catching. Always proofread your text. Never publish your post until you are sure that it’s totally correct and looks good on the page. Update your old posts to make them more accurate, comprehensive, and full. Depending on the news and innovations your old post may not be relevant any more, so make sure that your blog is kept up with the times. Make sure that your blog can be easily accessed from gadgets. Text the mobile version of your site and the download speed. Make a light edition of your blog to make it accessible from any device. Using low-quality visual content. Make sure to use high-quality visual content that fits your text. Don’t forget about inforgraphics and other elements like diagrams that make your text more understandable. Good photos and pictures attract the reader’s attention. Not tracking the results. You won’t be able to make a good blog without knowing information on how good your blog is. Make sure that you have a statistics plugin like Google Analytics in your blog, so you can know who your audience is and what posts are the most popular. Making blog posts that are too formal. Don’t bore your reader with plain facts. It is better to tell the story to present those facts. Write in a friendly manner, and choose a conversational style so the audience will enjoy reading. Thinking that your clients don’t read blogs. It’s a frequent delusion among companies. Even if the activity of your company may seem uninteresting, people use search engines to find answers. And you can be the one to give the answer and get a new client. Using the first idea that has come from your head. Don’t forget that all your posts in the blog should be under the main goal: growing your business. Ask your manager to give you more information about the company goals and company values. Picking topics too broad. For example, you want to write about methods of promoting on the internet. This topic is too broad and to cover it; you will need to write a book. And when making such a topic more specific, tell about free services that will help promote your business, or talk about this topic in context of certain goods or services, or describe a certain method of promotion in Instagram or Facebook. Plagiarizing texts from other sources. Plagiarized essays are punishable at schools and colleges, and the same thing happens on the internet. Your blog can be penalized by Google if your content is not unique enough. You won’t make a successful blog by copy-pasting texts from other sources. Hopefully this guide will fuel your inspiration for creating a great business blog. Don’t worry if you make mistakes or if you don’t understand something. The first step is always the hardest one, but over time everything will become clear. As we have already said, blogging is not a piece of cake. To bring success to your blog, you need to make regular posts with quality and relevant content keeping in mind your audience. It may seem that this is a boring and time-consuming process, but the future prospects of such a post may lead a lot of new clients into your business.